As a guideline though, pale yellows are a better choice for spring, while a brighter yellow is usually reserved for summer weddings. When it comes to fall and winter, consider darkening that yellow by a few shades and you have a beautiful warm golden hue that's sophisticated and stunning, especially paired with the deep shades of winter colors. Yellow and gold pair up beautifully with many other popular bridal color selections. Mix it with most shades of brown for an elegant look. Paired with black it is sophisticated and stunning. Other colors yellow/gold work well with are: burgundy, emerald green, teal, blues, varying shades of purple, orange, creams, and white. In fact, I don't think there's really any color that doesn't work well with yellow! 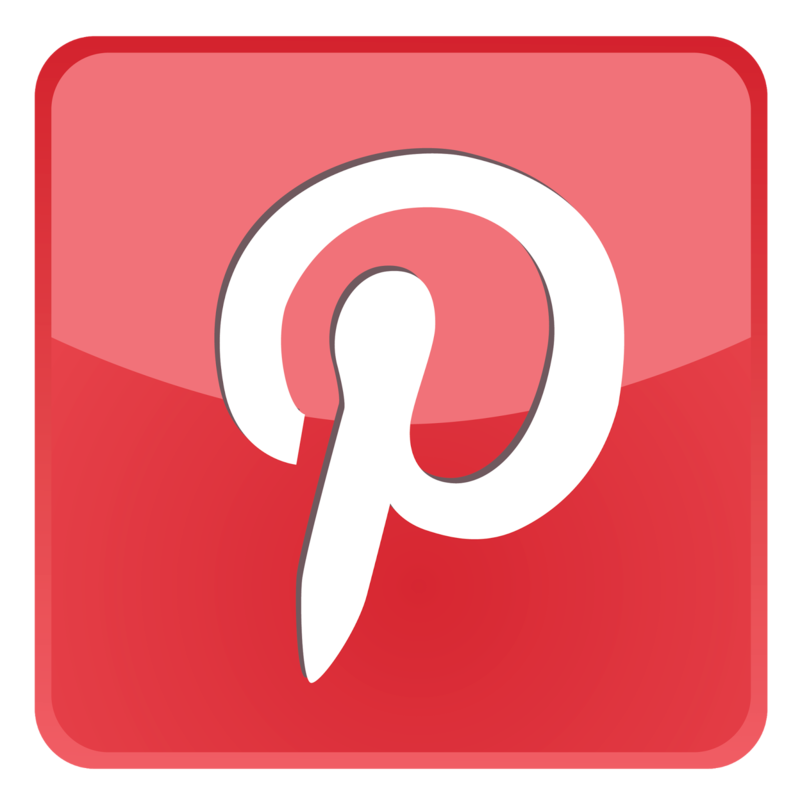 When it comes to your flower bouquets and arrangements, the variations in colors and floral choices is quite large. Yellow roses, mini daffodils, orchids, tulips, daisies, lilies, carnations, and chrysanthemums are just a few that come to mind. 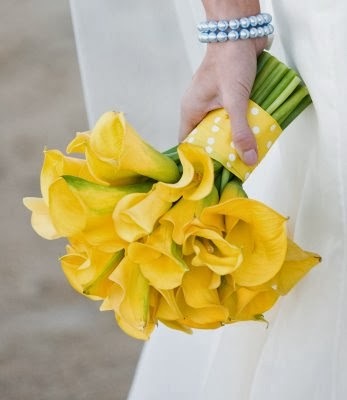 Accent them with a contrasting color or use several different shades of yellow in one bouquet. Adorn your tables with yellow pillar candles nestled within a circle of golden or white chiffon material for a simple, yet beautiful centerpiece. Or perhaps a tall clear vase with a single yellow rose is more suitable for your wedding style. Want to add some light fun to your décor? Fill clear large vases with sliced lemons pressed along the glass, fill with water and set a small, lovely flower bouquet on top. Better yet - just fill large glass vases with lemons! 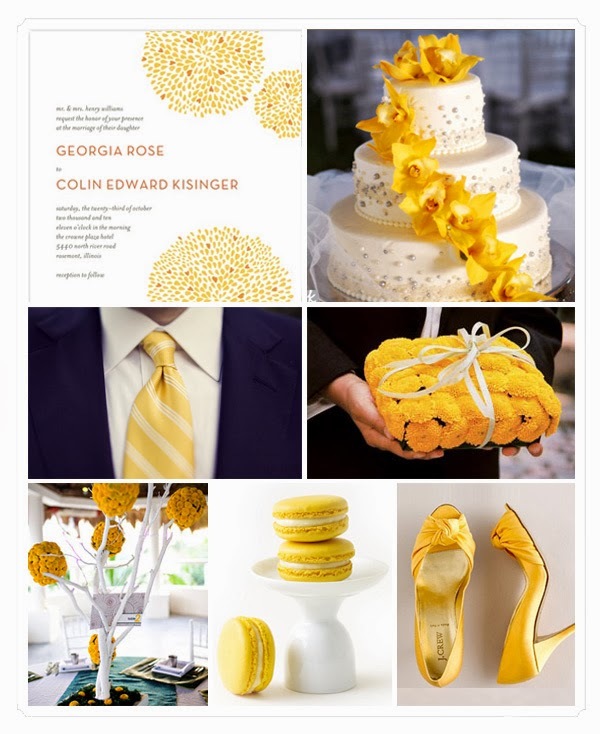 Bumble Bee Wedding Theme - Your colors will be black and yellow, preferably used in a striped pattern. 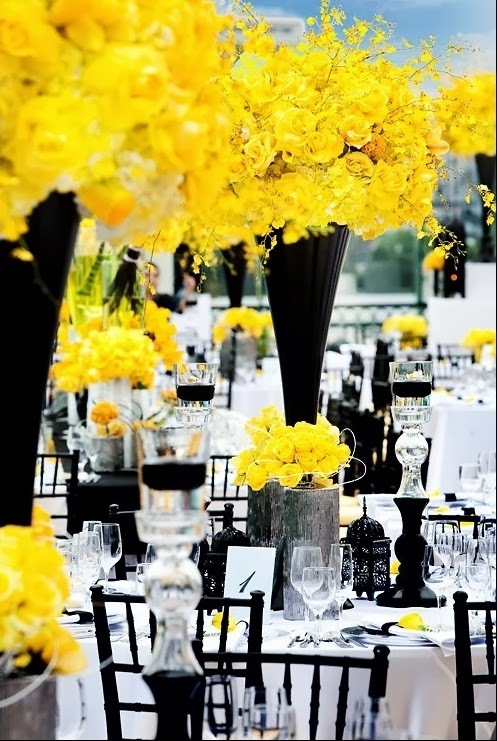 Place black vases with yellow roses as table centerpieces and use yellow napkins with a black napkin ring for emphasis at each place setting. Present your guests with mini refrigerator bumble bee magnets or small favor boxes stamped with a bumble bee on top. Fill with almonds or mints. Another cute favor is a small bee-hive shaped ceramic honey pot with dipper. 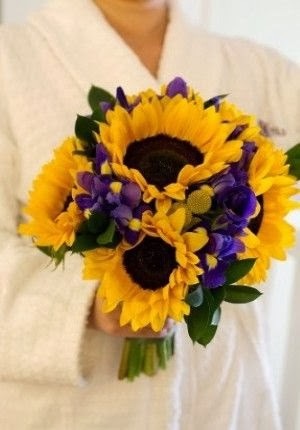 Sunflower Wedding Theme - Use the actual flower as your theme. This sunny, summertime flower is a perfect choice and is easily paired with the color brown. 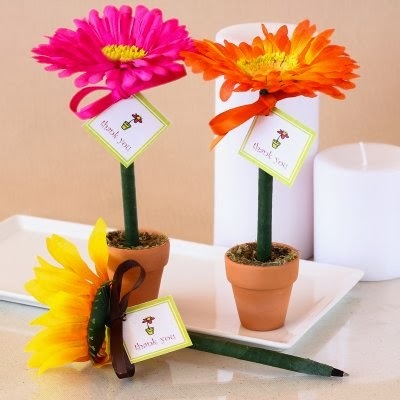 Make or buy sunflower pot pens as favors (this is a pen that's been wrapped in green floral tape and a silk sunflower is attached to the top. Insert the pen into a small clay pot that contains floral foam). The above are just some theme ideas that work very well with yellow weddings. 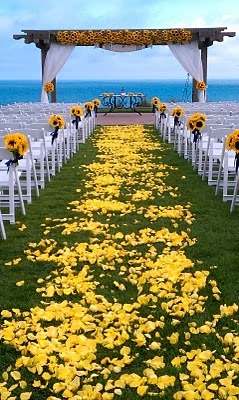 You could also plan your wedding around: baby chicks, yellow ducks, any type of yellow flower, the sun, even yellow canaries! 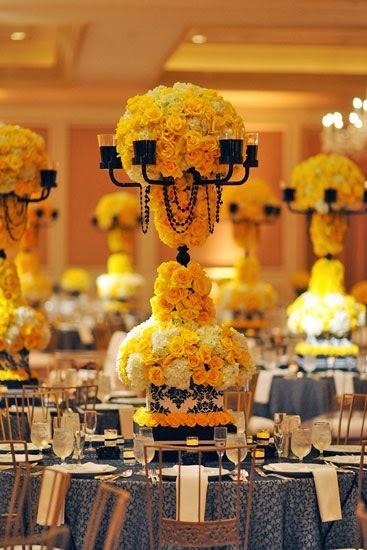 When it comes to your yellow or golden wedding theme, let your imagination soar.